I made some beer bottle torches, following this tutorial, for the summer. Thanks to the cool weather and lots of rain, our backyard is so full of mosquitoes this year it's ridiculous. The torches help a little but not enough. It's kind of a bummer since we just got a fancy grill installed and were looking forward to spending a lot of time in the backyard this summer. But on the plus side, our yard has never looked nicer - also thanks to the cool weather and rain. All the plants are flourishing - hostas are huge, groundcover is spreading, fruits are ripening - and all we've done is weed a few times, scatter some seeds and plant a few annuals. 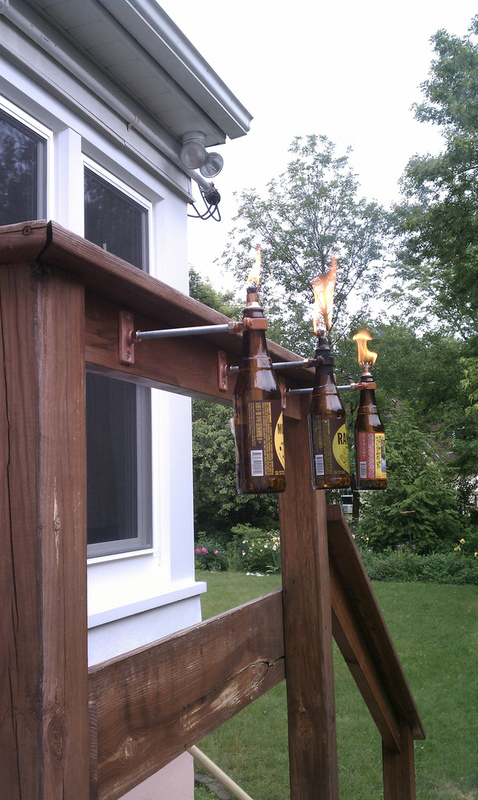 I was able to find all the parts for this project in only one trip to Home Depot. That is amazing. Usually projects that take a trip to Home Depot require at least 3 trips to Home Depot. I did make one trip to my local Ace store where I bought materials for the torches themselves, but Ace did not carry the hardware to hang the torches.